After an absence of 79 years, Harry Shlachter, 83, scans the Polish landscape he hadn’t seen since childhood. GOLUB-DOBRZYN, Poland -- My father settled himself near the front of a minibus we hired to take him "home." It was his first visit to the town of his birth since leaving Poland 79 years ago, at the age of 4. But my mother, Ruth, and older brother, Rob, were just as determined to make the trip -- with or without Harry. In fact, early stages of planning had counted him out. Aware of his reluctance and possible reasons, I mentioned to my father at one point that more Poles were honored by Israel's Holocaust memorial, Yad Vashem, as "righteous Gentiles" -- for saving Jewish lives -- than people of any other nationality. It surprised him that Polish Catholics had helped his own relatives. He quietly gave in a few months before the planned departure. From the corners of our eyes, we scrutinized this octogenarian from Delray Beach, who played his emotional cards close to the chest. Harry disclosed nothing. "That's something I remember," my father suddenly said as we approached Golub-Dobrzyn (pronounced gahlub-DOEB-zhen). He gestured toward a horse-drawn hay wagon. It was the only non-motorized vehicle we saw in an economically buoyant, post-Communist Poland, aside from fancy open carriages gliding tourists through the magnificent main squares of Warsaw and Krakow. No one knew what to expect of Golub-Dobrzyn, once neighboring towns divided by the River Drweca (dreh-VENTZA). At the back of my mind was a friend's trip to his father's birthplace in the Czech Republic, which turned out to be one of those places left a blighted wasteland by the Communist era's environmentally heedless policies. By contrast, Golub-Dobrzyn turned out to be a rather pleasant place and something of a scenic tourist destination, with a restored castle and summer jousting competitions. Golub was for centuries Prussian (as in German), and the pointed roof lines on storefronts lining the charming town square reflect this heritage. Across the river is Dobrzyn, which had been controlled by Russia until Poland's independence in 1918. The two communities merged only after World War II. Dobrzyn, where my father spent his first years, had a more modest square with few stores. An old map, provided by a researcher we had asked to trace the family's history, showed two properties owned by Szlachters before the war. A 67-year-old Catholic, Edward greeted us like long-lost relatives. He had made the community's links with its Jewish past an active interest, meeting returning families like ourselves. He also ensured that fresh flowers bloomed at a small monument, overlooking the Drweca, that the handful of Jewish survivors of the Nazi actions had erected in memory of those who perished. Once Dobrzyn had 3,000 Jews -- more than half the town's population -- and they formed a vibrant community with its own library, soccer team and social welfare society. But on Sept. 14, 1939, the Jewish New Year, 270 men and boys -- including my father's uncle and cousins -- were seized at the main synagogue and herded aboard trucks. To us on this summer trip, it was obvious but unsaid that if my father had not emigrated he could easily have been at prayers that day early in the war. In batches of 40, those citizens were taken to a field and shot. It was the second mass execution by the Nazis since Poland had been invaded, just two weeks earlier. Only 57 Jewish residents were to survive the Holocaust, and none returned to live in Dobrzyn. If not for the squat marker and Edward's efforts, the German soldiers would have been successful in erasing any reminder of two centuries of Jewish life here. Pelting rain this day would not dampen Jasieniecki's enthusiasm as he led my father -- 83 and with double knee replacements but somehow never tiring -- from landmark to landmark. We visited an apartment house (circa 1929) owned by a Szlachter and an older, smaller home at No. 5 Pilsudski St., its cramped quarters now shared with a candy shop and a beauty salon. A woman, who said she had resided at the Pilsudski Street home since 1947, was not the least hesitant to open her home to this party of 13 sodden American strangers. "I lived here," my father announced to the woman, Jadwiga Witkowska, as she ushered us in. Neither he nor the rest of us had any certainty it was the right house, but Shlachters, possibly relatives if not his own immediate family, once had dwelled within these walls. Each spoke of uncles who had immigrated, who could not adjust to American life, and who each had emergency appendectomies that convinced them to return to Europe. A grain of truth existed somewhere; we just didn't know on whose side of the family the grain lie. "We used to keep a goat," my father said at No. 5 Pilsudski, his English translated by our guide. Then, with feigned alarm, my father looked around and shouted, "The goat's gone!" A pretty good ad lib for a man confronting the site of his childhood. After we had posed for pictures, a woman passer-by stopped and asked who we were. "Yes, I remember the Szlachters," she said, reaffirming that a family by that name had lived there before the war, across from what had been the Jewish school. The school is now a dwelling, the synagogue gone but for a small chunk of foundation, and the cemetery begun in 1770 now a faint memory known only to Edward Jasieniecki and a few others residents. Little seemed familiar to my father but there were recollections of things his mother had told him. There was the Polish noblewoman who had taught his mother English, before World War I, and the successful sewing enterprise she ran before marrying. In the chaos that followed the Great War, my father said he himself recalled peeking from a window during a pause in a pogrom or civil disturbance, and he spotted an elderly neighbor leaning out of a window only to be fatally shot. That stark memory was the most indelible. The rain fell harder after we rounded the synagogue ruins. When we boarded our bus, Edward announced we were going to his apartment, located in one of the plain concrete blocks built by the thousands during Communist rule. Inside, the flat was warmly inviting and Edward's wife stood before us smiling widely. For this pack of strangers, she had laid on a massive afternoon tea with cakes and raspberry tarts. "Oh my God, I can't get over this," my father said of Edward. "He didn't know what more he could do for us. His wife made us coffee and many cakes. The hospitality was so unexpected. He seemed sincere and that I have to accept." As we left, Edward Jasieniecki embraced Harry Shlachter, the Dobrzyn-born American who could have been his neighbor, but for history. 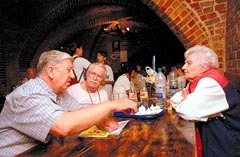 Edek “Edward” Jasieniecki, left, tells Ruth and Harry Shlachter about the Jews of Golub-Dobrzyn, Poland. Before World War II they made up the majority of townspeople; at war’s end only 57 remained alive. Harry Shlachter points out details on a map of his Polish hometown. Two grandsons, from left, Zach, 12, and Jeremy, 18, with Harry’s son, Barry, right, were part of the family group that visited Poland. 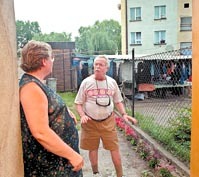 A possible spark of recognition is ignited when Jadwiga Witkowska, left, shows Harry Shlacter her back yard. He believes her home may have been his birthplace.